What Role Will Human Rights Play in Trump's 'America First' Foreign Policy? FILE - U.S. President-elect Donald Trump speaks during a news conference in the lobby of Trump Tower in New York, Jan. 11, 2017. It was April 2011, just weeks after the start of a U.S.-led bombing campaign in Libya. Donald Trump, then a reality television star, was speaking to The Wall Street Journal about whether he supported the NATO military intervention, which ostensibly began as a humanitarian mission but eventually would lead to the ouster of Libya's longtime leader Moammar Gadhafi. “I’m only interested in Libya if we take the oil. If we don't take the oil, I have no interest in Libya,” said Trump, adding that he would pursue a similar policy with Iraq's vast oil reserves. Such action would violate the Geneva Convention, which prohibits pillage. Fast forward several years, and Trump was still making the same threat. He was now the Republican Party presidential nominee and was delivering a major address on terrorism, just weeks before the general election that would sweep him to the presidency and put him in command of the world's most powerful military. “I was saying this constantly and to whoever would listen: keep the oil, keep the oil, keep the oil,” said Trump. Previously, he had suggested the profits from the sale of Iraqi oil be used to fund U.S. social welfare programs, such as Medicare and Social Security. Now, he said the proceeds should be used to pay the families of dead and wounded U.S. soldiers. Trump's threat to “take the oil” is just one of several of his campaign proposals that human rights activists say would violate U.S. or international law. He also has supported reviving the use of torture against suspected terrorists and killing the families of Islamic State leaders. Taken together, they are indications that Trump may reorient U.S. foreign policy around perceived national interests at the expense of human rights. But the approach leaves many to wonder: in an “America First” foreign policy, what role will human rights play? “We have great concern that this is going to be an administration that either doesn't engage in [human rights], isn't interested in them, or instrumentalizes them to get what they want in other arenas,” says Sarah Margon of Human Rights Watch. The U.S. has never based its foreign policy solely on human rights. Like any government, Washington weighs its values against its perceived national interests. 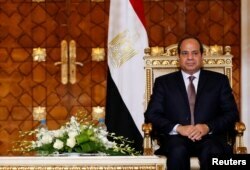 The end result is that U.S. presidents at times ally themselves with human rights violators. The U.S. also has participated in wars motivated at least in part by the desire for natural resources. What's different about Trump is that he enters office having publicly championed proposals that blatantly disregard human rights, says Leslie Vinjamuri, a professor of international relations at the University of London. Egypt's President Abdel Fattah el-Sissi attends a ceremony at the El-Thadiya presidential palace in Cairo, Oct. 5, 2016. In a report last week, HRW listed Trump as a major threat to human rights. Specifically, it noted Trump's promises to reinstate torture and deport mass numbers of immigrants, as well as his portrayal of refugees as terrorists. “Unless Trump repudiates these proposals, his administration risks committing massive rights violations in the U.S. and shirking a longstanding, bipartisan belief, however imperfectly applied, in a rights based foreign policy agenda,” the report said. Trump also appears set to expand relations with authoritarian leaders around the world, especially those fighting Islamic extremists. The president-elect has frequently praised Russian President Vladimir Putin, calling him a strong leader. That cooperation is likely to extend to Syria, where Moscow is backing longtime President Bashar al-Assad. Trump's approach to Russia is not altogether unique. Many U.S. presidents, including Barack Obama, have entered office hoping to improve relations with Moscow. Trump has precedent for this, too. There has been strong bipartisan U.S. support and financial backing for Egypt's authoritarian military rulers, who have helped fight Islamists and who help preserve the regional status quo related to Israel. 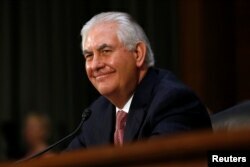 Rex Tillerson testifies before a Senate Foreign Relations Committee confirmation hearing on his nomination to be U.S. secretary of state in Washington, Jan. 11, 2017. But Trump and some of his top cabinet choices often express a reluctance to even criticize rights abusers. That reluctance was on display last week, during the Senate confirmation hearing of Rex Tillerson, Trump's choice for secretary of state, who recently resigned as CEO of ExxonMobil, the world's largest oil company. When pressed, Tillerson refused to say Putin's military efforts in Syria amount to war crimes, and would not condemn Philippine leader Rodrigo Duterte, whose war on drugs has left thousands dead. Other Trump cabinet appointees have distanced themselves from their boss' controversial proposals. 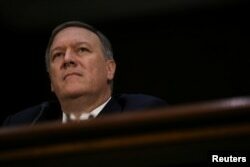 For example, Congressman Mike Pompeo, Trump's pick to head the CIA, said last week he would “absolutely not” be willing to restart “enhanced interrogation” techniques, such as waterboarding, even if ordered to do so. Mike Pompeo testifies before a Senate Intelligence hearing on his nomination of to be become director of the CIA in Washington, Jan. 12, 2017. Presidents frequently make campaign promises they never fulfill. Trump already has backed away from some of his most contentious plans, including waterboarding and a ban on Muslim immigration. So there are reasons to question whether Trump will follow through on such plans. His campaign declined to comment for this story. Some of the uncertainty could be intentional. Trump has repeatedly stressed the need for U.S. foreign policy to be unpredictable. Trump's staff also has suggested his words shouldn't be taken literally. “My foreign policy will always put the interests of the American people and American security above all else. It has to be first. Has to be,” Trump said.